Busy week (finishing off some magazine commissions and preparing for Isabelle's 4th birthday on Saturday!) but I managed to whip up a card yesterday. The sketch I used is from Wild Orchid Challenge. 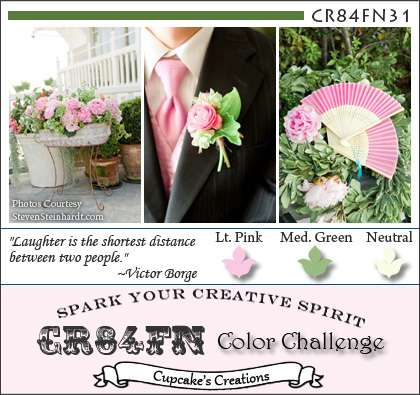 The colors I used are from this week's challenge at CR84FN Color Challenge. 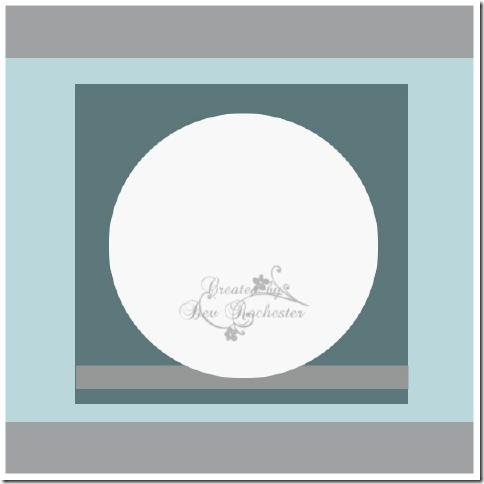 I hadn't starting out thinking I'll make a floral wreath on this card, it just kind of evolved. I wanted to use this fab doily die I just received from Die-namics (it's the Dainty Doily Lace Die), you can just see it behind the wreath. I really love it and I should get a lot of use out of it. 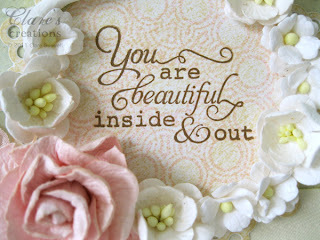 The 'Oh so beautiful' sentiment is from the Celebrating You Stamp set by Nina B at The Craft's Meow. All the pretty flowers are from Wild Orchid Crafts. I love these little sweetheart blossoms and cherry blossoms, all their flowers are gorgeous!!! I also stamped a doily from the Dainty Doilies Large Set from Waltzingmouse Stamps in the centre. There's a little cream twill in there from The Ribbon Reel, don't forget you have a couple more days to enter the Ribbon Reel Challenge with a chance to win all those lovely ribbons. The pretty pink rose is also from Wild Orchid Crafts. The sweet applique leaves I bought on Etsy. The pearl trinket pin I made. Underneath all that there's a double bow of seam binding. The little bird I made using some white Fimo and a little silicone mould from Etsy. I like to leave them white sometimes and they look just as nice. The green paper is from Prima Botanical. The paper behind that I stamped with various stamp sets including Dainty Doilies Large Set by Waltzingmouse Stamps, Happiness Is Stamp set from The Craft's Meow and some text from a Crafty Secrets Stamp set. Ok... off to buy some birthday presents and goodies for the party!! Other: Die cutting machine, Die-namics Dainty Doily Lace Die, Fimo, sewing machine, cream twill from The Ribbon Reel, seam binding, trinket pin, applique leaves, button. This is just stunning, I adore the dainty doilies stamp and die, just beautiful, I hope Isabelle has a fabulous 4th birthday on Saturday. I am blown away by the beauty of this fabulous card. That centerpiece with the dove and the flowers is amazing. 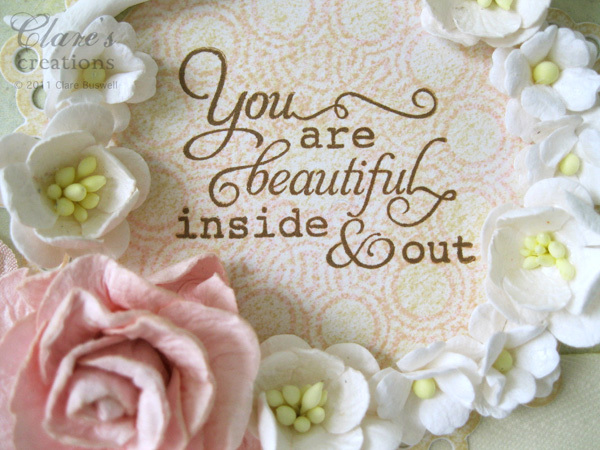 And I love the way you used that doily stamps as a background. Wow! Your cards always are so pretty and gentle! Thanks to you I've got some molds at etsy, but never played with fimo. Claire, LOVE the bird and the flower wreath! GORGEOUS card! THX for playing with us at CR84FN! Your card is exquisite! 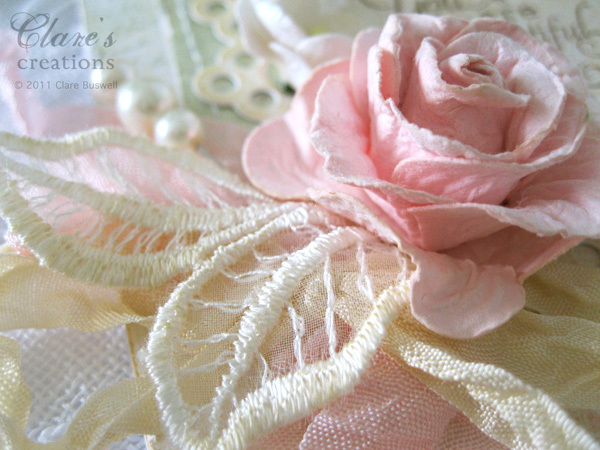 I love the colors, the wreath of flowers and your rose and ribbon embellishment. 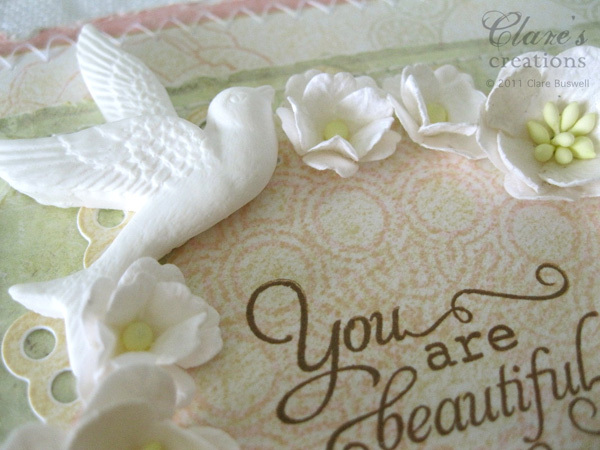 The doily stamp is beautiful and the dove you made is just the perfect touch. Oh Clare, this is stunning!! 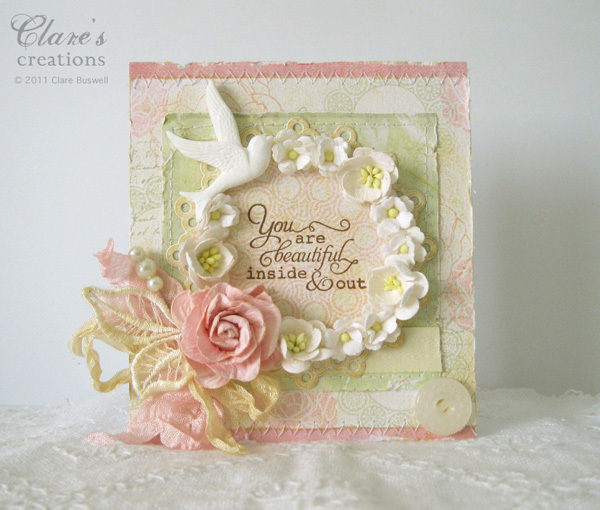 Love the fimo bird, and the gorgeous floral wreath! Oh my Clare, this card is a vision in beauty! You have such a wonderful gift for making cards that are just so feminine, soft and so darn pretty! I absolutely love your style...keep up the fabulous inspiration! Forgive me if my comment has appeared here several times--I was having trouble getting it to post; hopefully, it will work now! Anyway, this card is absolutely gorgeous! I just love it! Your card is like a sweet little wedding cake! All the layers and trim are so beautiful. Love the little charm and the dove. You are so talented. I saw this at Wild Orchid Challenge and had to pop over to take a closer look! Very very BEAUTIFUL!!! Wow! This is just gorgeous! So many beautiful details and I love the sentiment. Thanks for playing along with CR84FN! So soft and delicate...very nice! All those flowers with the bird is pure beauty! 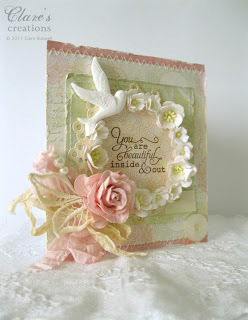 Such a fabulous card...so so pretty!!! Ribbon Reel Challenge 5 and some exciting news!! 52 weeks of Waltzingmouse sketches!! !